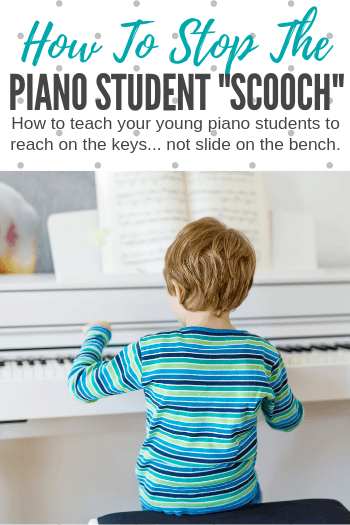 I’m guessing you know what I mean by “The Piano Student Scooch”… It’s that moment when your piano student needs to reach up or down an octave (or two) from where they are positioned and instead of reaching, they pause, take a moment to slide along the bench, and then resume playing. It’s cute when they’re 5 and at their first recital, but as your piano student matures, it’s important for them to gain the confidence they need to remain centered on the piano… without any “scooching”. I like to make most discussions about technique, posture, hand position, etc. into some sort of game. My students retain it better and then I can use fun language to remind them of what needs to be adjusted in the future rather than using boring old nagging-type words. So… here are 4 games you can play to help your piano student stay centered on the piano and learn to reach, rather than scooch. 1. Post-it-Note Reach – Use two small post-it notes. Ask your student to begin with her thumbs sharing Middle C. Her job is to move her hands from Middle C and reach out to grab the post-it notes without “scooching” or collapsing her posture to do so. Start simple (one post-it on Bass C and one post-it on Treble C) and then gradually move further and further away to where you can tell it’s no longer reachable for your student. Once she has mastered spreading her arms in opposite directions, then change and put both post-its on the right-hand side, requiring both hands to reach up and then switch to the left-hand side requiring both hands to reach down. 2. Landmark Landing – Give your student two small toys, buttons, characters… anything. With one in each hand, ask your student to place the characters on keys that are a “reach” away from where they are sitting, but use groups of black keys as landmarks instead of just naming keys. I call this “Landmark Landing” with my piano students as I say things like “Micky Mouse is coming in for a landing on the note that is in the middle of the group of 2 and Donald Duck is soaring down to the key that is directly above the group of 3.” Then have her name the note once she has “landed”. Why not just say “D” and “B”? These landmark black key groups will come in handy as your student is required to reach quickly to new hand positions. Thinking of the keyboard in terms of this easy visual of black key groups will make her reaction time much faster when she is required to reach within the context of a piece where timing counts. 3. Splat! – The next step is having your student be comfortable finding hand positions away from the center of the piano instead of just finding a single key. But it’s super boring to ask her to just place her hands in a position on the piano. So… allow her to Splat! This means that all 5 keys in a given hand position are depressed at once… in a very loud and obnoxious “splat!”. While it may seem like this is a gimmick to keep your student’s interest… it’s actually a really effective way of ensuring she is able to find all 5 keys within the correct hand position quickly and accurately. Here’s To “Reaching” Piano Students! After many years of patiently asking my younger students to “glue themselves” to the bench when they needed to reach out of a middle-of-the-piano position, these 4 games evolved. And that imaginary “glue” became real “glue” as they then gained the keyboard awareness and confidence to remain centered on the bench and simply reach. Give it a try and banish the “Piano Student Scooch” from your studio too! The Piano Teacher’s First Lesson Check List… Are You Including These 10 Things?